Nothing fits like an old shoe -- especially if that shoe walked the earth five thousand five hundred years ago. 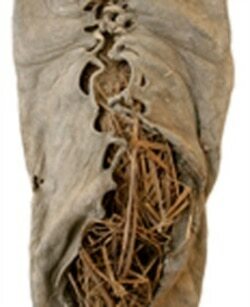 Researchers in Armenia found the world's oldest leather shoe, and they say it was in surprisingly good condition. Doctoral student Diana Zardaryan of the Institute of Archeology found it in a cave near the border with Iran and Turkey. She said "even the shoe laces were preserved." It fact, the team of archeologists first thought it was about six or seven hundred years old. Then two laboratories in the United States and Britain did radiocarbon tests. The dating showed it was four hundred years older than the Stonehenge formation in England -- and a thousand years older than the Great Pyramid of Giza in Egypt. The cool and dry conditions in the cave protected the shoe and other objects. So did a thick, solid layer of sheep dung covering the floor. This acted as a seal to prevent damage. The shoe was made from a single piece of cowhide. The researchers believe the shoe was shaped to fit the wearer’s right foot. The shoe is small -- a European size thirty-seven, or a women's size seven in the United States. The lead author of the research says he does not know if the shoe was made for a man or a woman. Ron Pinhasi of University College in Cork, Ireland, says it could have fit a man from that time period. His team also found grass packed inside the shoe. They say the grass might have been used to keep the wearer’s foot warm. Or it could have been used to hold the shape of the shoe while it was not being worn. The shoe is similar in design to "pampooties." These were shoes worn on the Aran Islands, in the west of Ireland, until the nineteen fifties. This kind of shoe appears to have been worn for thousands of years across a large area of Europe and beyond. The team of scientists also found large containers of wheat, barley and apricots in the cave, along with a broken pot and sheep's horns. They also found the graves of children buried near the back of the cave. They do not know why all these things were found together in one place. They do not know what the purpose of the cave was. The archeologists published their findings in the online scientific journal PloS One, from the Public Library of Science. They are continuing their work in Armenia. They say there are many other parts of the cave they have yet to explore. The oldest footwear of any kind ever found are sandals made of plant material. Scientists believe sandals found in the Arnold Research Cave in the American state of Missouri are about seven thousand five hundred years old. That makes them about two thousand years older than the leather shoe found in Armenia. I'm Jim Tedder, VOA Special English.